Do you ever have those moments when you’re doing something totally mundane and then Jesus decides that he’s going to explain something to you? It’s awesome right? 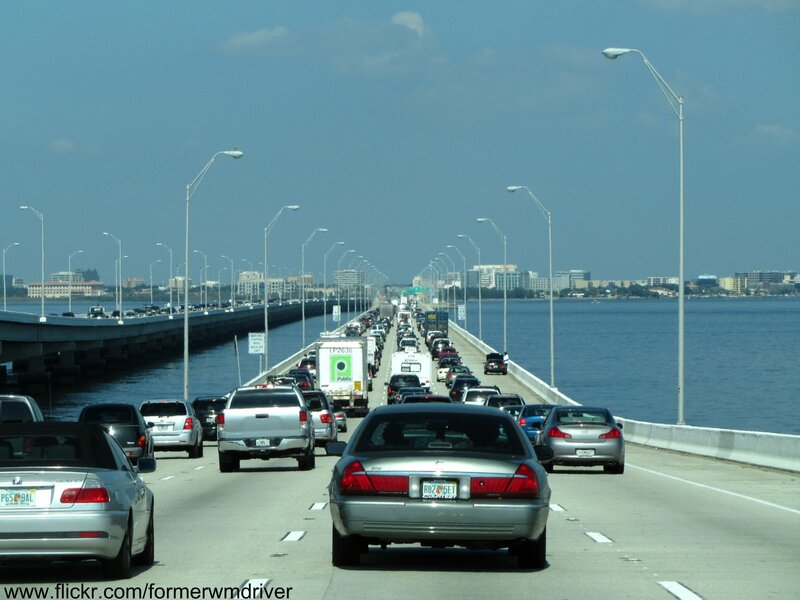 Well a few days back I was driving home from the Tampa Bay area of Florida (no I didn’t take that picture while driving but it is a bridge going in the area) with the cruise control on and around Orlando I hit some traffic. That’s no real surprise, I mean it’s Orlando. It’s not as bad as Atlanta, but it’s still not the most fun place to drive through. The cruise control had to come off and I had to then focus on navigating the traffic safely while maintaining my time. I was already not going to get home until around midnight and did not want delays. As I began to look around for an opening to pass the cars in front of me in the middle lane of I-4 the Lord reminded me of the verse about the wide and narrow paths. Then a contentment came over me and I just stayed in the middle lane behind a car that I thought was going WAY too slow, but turned out was going the speed limit and obeying the law. Meanwhile, cars zoomed past left and right, weaving between lanes and to get ahead. Do you see the imagery here? We’re all on one path or another. In the prophetic words of Tom Cochrane, “Life is a Highway”. In the past I’ve always thought of this passage as two separate roads, probably from pastors and teachers using the examples of a major highway compared to a scenic route, but here God showed me that it’s not necessarily like that. See we’re here in this world with the people who are on the highway. Jesus prayed in John 17 that we’d not be removed from the world but to be set apart. So an 8-hour journey from the central gulf-coast of Florida to the Midands of South Carolina became a time of revelation. Just like in our everyday life as we’re interacting with believers and non-believers alike, we have a choice to make. Which path are we going to follow? Are we going to use every lane possible to meet our own needs and desires leaving behind those who aren’t fast enough to keep up even if it means violating the law (now think if I mean the law of the land or the law of the Lord?). And that narrow path, it wasn’t out on some wooded back road, it was right there, in the midst of the craziness of the city. And there were those in the middle lane behind me who veered to the left to pass before returning to the middle. In traffic, there’s nothing wrong with this, but consider this: How often do you or someone you know compromise and move away from the Narrow Path of Christ for just a little while to achieve or attain some object or goal and then try to fall right back in line with him. Again, just wanted to share this with you all. I hope it makes you think as it’s made me think. This is great! I love when God meets us and speaks to us right where we are at.